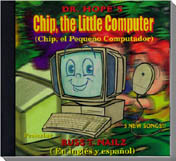 This audio CD has the Chip, the Little Computer story acted out with voice actors and special effects. Plus there are five original humorous songs performed by actor/singer/comic RUSS T. NAILZ. Copyright 2001 by Alpine Publishing, Inc.